I think this funky set of drawers looks a bit like it’s made out of Lego, funnily enough it behaves a bit like Lego too. The Be Maxi Changer is one of the most versatile sets of drawers I have ever seen, and we feature a lot of shape-shifting furniture. Basically this brand makes colourful pieces that all mix and match to suit whatever needs you have. 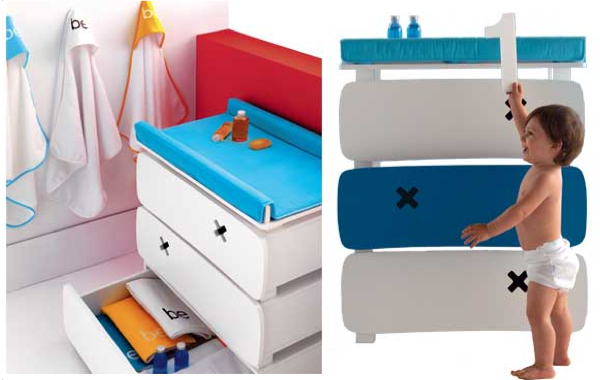 This set comes with three drawers and the option of adding on a change table, you can customise the colours and stack them as high as you want. It can be transformed into a bench, a TV cabinet or underbed storage. It is all made with lacquered MDF so isn’t too heavy and can be converted really easily. You can also choose which side you want the handles on. The colours are really fun and modern, perfect for a gender neutral nursery. For £625 you get three drawers and it is £99 to add a change table. This brand is actually pretty amazing, if you want to see the other furniture they make (and what it changes into) watch this stop animation.